Normally, I would simply admire A. muscaria and move on, but here I immediately crouch to pluck them from the ground. For in the kingdom of Tamriel, A. muscaria has far different properties: It's a potent ingredient in shock potions, which are going to be useful when exploring the nearby Ayleid dungeon. The world of The Elder Scrolls IV: Oblivion has an unprecedented level of beauty and detail. Emerging from the sewers at the beginning of the game, players finds themselves blinking in the sunlight in a landscape that, if not for the strange ruins dotting the countryside, could easily be mistaken for a rural area of North America. This is due not only to the realistic textures of the terrain, but also the familiar trees, plants, and mushrooms that populate the land. Beautiful games are usually strongly stylistic, but Oblivion is much more subtle - it offers less a style than a magnified version of reality. The familiarity of real-world plants in Oblivion provides the player a deeper level of immersion and makes the fantastical elements of the game that much more striking. 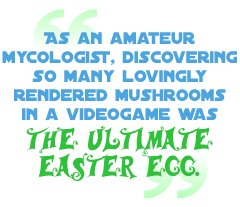 As an amateur mycologist, discovering so many lovingly rendered mushrooms in a videogame was the ultimate Easter egg - a secret tribute to the world of fungus in the last place I expected to find it. While A. muscaria is not surprising to stumble across in a videogame - a casual look through your grandmother's kitchen might turn up red-and-white A. muscaria salt shakers or a badly painted wooden sign with its likeness - the inventory of mushrooms in Oblivion extends beyond the common species to include varieties like the Tinder Polypore and the Bog Beacon, a tiny mushroom found on rotting leaves. Some of these were uncommon enough that I had to look them up in my Audubon guide to confirm their existence.